A note in 2006: A tradition has passed. Jeanne Bonk has chosen to retire and close Empress of India. 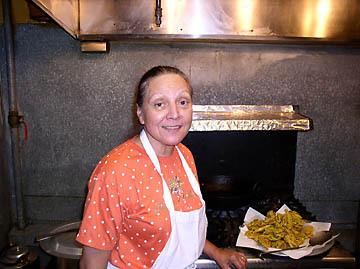 I had the good fortune to take some cooking lessons from her in 2005, which demonstrated even more completely to me why her cuisine stands so high. We will miss this great restaurant. This review will remain on-line here as a historical tribute to one of the great Indian restaurants in the Bay Area. With dozens of Indian restaurants around the South Bay, this humble storefront hideaway distinguishes itself. One would never expect to find such a treasure, tucked in back of an old El Camino strip mall near Lawrence Expressway, letters fading from its sign; yet Empress of India attracts a core following of passionate food lovers. People come for Jeanne Bonk's cooking, which ranks among the best Indian food in the South Bay. 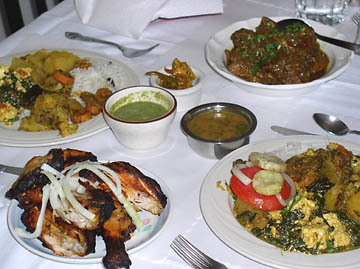 Empress of India has limited hours, only weekday lunch and Saturday dinner. However, if you have a group of 10 or more, with two days' notice, Jeanne and her husband Robert will open the restaurant just for you. Empress of India has no menu. The selection changes daily, depending upon the freshness of market produce. The prix fixe meals cost $11 per person for lunch, $25 for vegetarian dinner, $30 for dinner with meat courses. Beer and wine cost extra, as do tax and tip. These prices might seem high compared to most Indian buffets, but this food is worth it. Certain fundamentals apply to any good food, regardless of nationality: top quality ingredients, intuition for balancing flavors, appropriate treatment for each ingredient. Sometimes restaurants will attempt to impress our palates by using too much fat or salt, but the best chefs let fine ingredients sing for themselves. Jeanne Bonk's cooking tastes real, like perfect home cooking, not heavy or oversaturated. You won't find puddles of ghee (clarified butter) floating in her dishes. You won't find red food coloring on her tandoori chicken. You won't feel bloated after eating her aromatic fresh curries. Empress of India opened in 1989, a sort of retirement hobby for the Bonks. Jeanne grew up in Allahabad, Northern India. Although her parents were Scottish and Armenian, she learned Hindi in school and learned how to cook from the locals. She met her American husband in France while he served in the military. They moved to California from the East Coast in 1973. Her husband Robert goes shopping each morning for fresh ingredients, which Jeanne then weaves into the daily menu, improvising on whatever he finds. She has even included fresh tandoori trout, caught by their son on a fishing trip. When a friend first told us about Empress of India back in 1999, he suggested we plan ahead and make reservations. When I called, Jeanne asked if we wanted extra spicy dishes, and if we wanted meat. We said yes to both. Four of us arrived on the appointed evening, and sat down to a table that quickly filled with steaming platters of vegetable curries, hot naan bread, mixed vegetable pakoras, tandoori and chicken tikka masala. Course after course appeared, each uniquely perfumed, surprisingly spicy but elegantly balanced in flavor. We eventually surrendered to the chef, saturated with sensation, astonished with both quality and quantity. We savored the leftovers for two days. Since then, Empress of India has remained on our short list of favorites. On a recent weekday we returned to remind ourselves about Jeanne Bonk's cooking, and to try lunch for the first time. As Robert sat us down, he reminded us about their menu-less approach, and asked if we wanted chicken with the vegetable dishes. Plates in hand, we walked to the rear where several steam trays held the vegetable curries. More dishes appeared fresh at our table upon our return, including toasty fresh pakoras, naan, tandoori chicken and chicken masala curry. The freshly fried vegetable pakoras showed no hint of grease. Crisp breading of garbanzo flour redolent of coriander surrounded strips of onion and fresh spinach leaves. We dipped these into fresh spicy green chutney made of cilantro, mint, jalapeño, lemon juice and salt. Each of the vegetable curries tasted fresh and individual, despite sitting in steam trays. The potato curry showed complex layers of spices and a serious smokey afterburn from fresh savina peppers, tasting not unlike habaneros. The dal (lentils) featured crumbs of toasted garlic whose nutty soft bitterness offset cumin and fresh ginger. Mixed vegetable curry blended sweet cauliflower (not overcooked), potato and eggplant in a savory light sauce with mustard seed, anise, hints of dill weed, cilantro, fenugreek and ginger. The anise sparkled on the tongue. The palak paneer used fresh house-made cottage cheese (paneer) combined with spinach, browned onions, fresh tomatoes, cumin, turmeric, ginger, garlic and chiles. The spinach came from fresh leaves, not frozen, and the delicate spices flattered the ingredients in a healthy low-fat sauce. Jeanne Bonk's meat curries have occasionally astonished me with their balance between subtlety and intensity. The lunchtime chicken masala unfolded in layers of warming sweet flavors, with chunks of cinnamon stick, green and black cardomon, cloves, coriander and cumin. A perfectly lingering smolder from savina peppers slowly brought perspiration to my forehead, yet never overpowered the rich blend of spices. On a past visit, I revelled in a king crab curry that also featured this exquisite nuclear afterglow from savina peppers, yet with a light tomato fish broth that danced in a seductive fabric of delicate fresh herbs. Spicy beef or lamb curries also make frequent appearances, and specialties like lobster might surface on occasion. To describe each dish at Empress of India fails to do it justice. Each bite reveals tiny sparks of fresh flavor, each ingredient contributes something appropriate to the blend. This sort of culinary artistry differs from the showy inventions of a celebrity chef. Its magic lies in the loving implementation of traditional cuisine, both complex and humble. Jeanne Bonk cooks, not like she's in a restaurant, but like she's cooking for her extended family. She has created a surrogate home for discerning lovers of Indian food. She knows many of her customers by name, she cares for them like a mother, and they return her warmth with a loyalty rare in the restaurant world. When people ask me where to go for good Indian food in the South Bay, I'll mention some of the many great choices nearby. Then I'll tell them to plan ahead, perhaps get a group together, and make a special trip down to Empress of India. Dinner Sat 6:30-9:30 or group reservation other days.